My employer, West Monroe Partners, will once again be sponsoring the Chicago Architects Group monthly meeting Tue, July 20th. Chicago has a strong technical community and as I've mentioned before, I'm proud to see WMP support the continued growth and learning of the community at large. This month's topic is "Architecture And Business Intelligence" by David Leininger. Details and registration can be found at http://chicagoarchitectsgroup.eventbright.com/ Presentation begins at 5:30pm at the ITA/TexusNexus space in the Loop. Attendance is free thanks to corporate sponsorships, such as West Monroe Partners! I hope you'll join me there! Chicago Architects Group was founded on the goal to unit various technical architecture competencies into a community for collaboration and knowledge sharing. The group is for people to meet their peers and share some stories and ideas. Architects and those aspiring to understand technical architecture better will enjoy this group. (text from http://chicagoarchitectsgroup.com). This entry was posted in UserGroups , Networking . For over a year now I've been attending technical user group meetings across the Chicago area and one in particular has caught my interest more than the others. The Chicago Architects Group ("CAG") has consistently provided presentations and discussion on topics relevant to me and by presenters with experience and knowledge on the subjects at hand. Presentations has ranged from Dependency Injection & Inversion of Control Containers, to Onion Architecture, to Agile Project Management strategies. And tonight will be Azure for Architects. All targeted to the technical architect audience, who discuss the topics, share personal experiences and insights. So now I am happy to be able to bring these two groups together, I believe to the mutual benefit of all: this month West Monroe Partners will be sponsoring the CAG meeting by funding the food and drinks. And there are plans in place to further sponsor at least two more meetings this year. So what does this mean? Well, it means that CAG meets continue to be free to anyone who wants to attend. It means that people can continue to learn about new skills, new technologies or alternate views on existing skills for the purpose of learning and growing and picking up on the experiences of others. It's a small way for WMP to help a community group continue to grow and better the larger technical community and I hope it's a pattern that will continue. The js.chi meetings follow a format of two main presentations, followed by three “lightning talks” (5-min quick presentations – although I have only seen one actually achieve the 5-min timeframe). Fairly large attendance again (20 – 30 attendees, from what I could tell), but had audio problems again, which meant it was difficult to hear beyond the first five rows or so (hint: arrive early to get a good seat – beers/sodas and networking before the meeting to help it along). Node.js is fairly new to the scene – started circa Nov 2009. It requires a POSIX environment, which means additional installs in Windows-land if you want to use it. Use out-of-the-box for Linux and friends. The framework provides library inheritance (like the “using” keyword in C#, #include in C). - Library is new and immature – but appears to be growing up quickly. The presenter is a founder of SauceLabs (http://saucelab.com), which provides cloud-based support for the UI testing framework Selenium (http://seleniumhq.org/). I’ve been wanting to play with Selenium, and if/when I do, this looks like an interesting model for grid-based/pay-as-you-go script agents. That’s all for tonight. Typically, after the meeting a smaller group goes to the Elephant and Castle pub for drinks and networking – but after a long week, and a list of must-do’s for the client status meeting the next morning, I opted instead to head home. I’m working on a blog (rather, the code which will lead to a blog) as an intro to Microsoft’s ASP.NET Charting controls and Google’s .NET Analytics API. Think: Building your own custom Google Analytics charts. Why? Because I want to see them on my Flash-less iPhone. And ‘cuz I’m a geek. This entry was posted in UserGroups . The CAG meetings I’ve been to have had between 10 and 20 attendees and tend to be more of the Architect/Team Lead types and less of the hard-core, in your face techies/developers (this is not a bad thing, in my opinion). Like most user groups, they have pizza and soda as well as giveaways at the end (today included Windows 7 Ultimate, Office 2007, a wireless mouse and several books). Personally, I find the meetings to be useful, although I know some of my coworkers who have come with me will likely not attend unless the topics are of great personal interest to them. But now you're tied to a specific implementation of ILogger and IValidator and if you ever wanted to change them, you'd have to modify your code anywhere you referenced those objects and replace them with your new ILogger object. This is less than ideal and makes your code a bit fragile. Still, you’re coding in a concrete implementation in your factory, so while you’ve isolated the number of places you need to update, you’re still hard-coding in an implementation. Additionally, if there are very deep dependencies (you’re Logger needs a FileManager which needs a PermissionsManager which needs a CurrentUserManager…. ), this can get pretty ugly to manage and you end up writing a lot of plumbing code that is only tangential to the application’s real purpose. This is where the IOC Containers come into play. Using an IOC framework, you define which concrete classes implement your interfaces and what dependencies they have. Then you use the IOC container like a factory class to instantiate your objects. There are two primary means for defining the dependency trees: using XML in your app.config or via code. Per the group discussions, some IOC frameworks provide tools (such as Structure Map) which will auto-generate your code mappings, while others (like Microsoft’s Unity Framework) use [Dependency] attributes to denote where there are dependencies. This allows you to say “I need an IWidget” and the container framework will know that ImprovedWidget should be created and it has dependences on ILogger and IValidator, which are provided by LoggerMananger and WidgetValidator, and so on. Has “scanning” tool to auto-map dependencies and limit the amount of manual configuration needed. (If only one class in your project implements a given interface, that class will be used when that interface is requested). Uses app.config to defined assemblies/classes to use for each interface. Uses constructor to provide dependencies. Uses [Dependency] attributes places on class properties to determine where dependencies are needed, as well as to get/set them. If you're in the Chicagoland area and do any .Net programming, I recommend this group. It's got a decent turnout (usually). I've been to three meetings with anywhere from 20 - 40 people in attendance. And they have good giveaways if you stay till the end. Today was especially good: A copy of Windows7 Ultimate, Office 2007, the JetBrain's product of your choice (ReSharper, dotTrace, TeamCity, IntelleJ -- great products if you're not familiar), $50 Barnes & Noble card, and of course a few Microsoft tech books. And free pizza! Presenter:John Nuechterlein (aka Jdn) (http://www.blogcoward.com). So, I'll be honest: Going into this presentation, I had only a very vague idea of what CQRS is and even less idea why I should care. (I had actually planned to play poker that night instead, but poker got canceled L). Leaving this presentation, my mind was swirling with all of the projects where CQRS would have been great to use (and the many parallels with the "massively" distributed computing environment we developed at Wayport. -- where "massive" is defined in pre-Google, pre-Facebook terms). In my mind, CQRS lends itself pretty well to web-based systems, and SOA/SaaS at that, although it could be applied elsewhere. I'm probably jumping ahead of myself a bit, but that statement is useful for backing this next statement. To consider using CQRS, you must buy into a fundamental assertion: your data is always stale. How stale depends on your system, but the fact that my last blog entry was about data caching techniques just goes to show that particularly in web-based system, we intentionally make some of our data stale by putting it into a cache. But even without intentional caching, your data is stale. Consider this: you have an eCommere site (say, amazon.com). Your end user pulls up the product page for the Widget2010 product, which includes price and quantity in stock information. In the 60 seconds it takes the user to read the page and click the shopping cart button, five other people have ordered their own Widget2010, so the quantity in stock is now less than what's on the first user's screen -- thus, the data is stale. You know this -- you expect this -- and you've already coded a dozen ways to deal with this, so accepting that "your data is always stale" is really not that big a leap of faith. So why is that important? Because the CQRS architecture separates the reading of data and the acting upon data into two separate logical areas, where the reading area has a data cache which is stale. Now, it may only be 1 ms stale, but stale none the less. This is the "reporting" piece -- or said another way, this is the read-only interface into your data. Basically, it's a lightweight data layer reading from your data store and proving DTOs back to your UI. It does NOT go through your Domain Model. It is simply a read-only view into your database. Your database, however, is really a cache of your data, and likely a local cache. In other words, since the data is just a cache of the "real" data, why not push it out as close to the UI as possible to minimize the latency to your UI (since the majority of your UI's interactions with your data is reading, making this link super-fast will in turn make your system faster). Since these are read-only views into your data, the DTOs are extremely simple and can/should be specific to the consumer (ie: no "product" DTO, but rather a productForOrderPage which only has the data needed by the order page) reducing the amount of data getting dragged around between layers, etc. Why pull your full product from the db if you only need 20% of the information for the current page? Need to scale your UI? Just add another data store/cache -- it's practically a rubber stamp. The next logical area of this architecture is the Command Bus/Command Handlers. This is where the next tenant of CQRS comes into play: system actions (aka "commands") have specific intent. If you've practiced Agile Development and you're familiar with the concept of the User Story -- basically requirements as documented from the viewpoint of a user's interaction with the system -- then this may be easy to grasp. Basically, Commands are actions taken on your Domain objects. For example: CustomerChangedAddressCommand or AddProductToShoppingCartCommand. Commands are the only way to update data in your system and are seen as atomic actions which can be wholly accepted or rejected. Commands are generated by the UI and pushed onto the Command Bus and picked up by Command Handlers. Command Handlers in turn pass those commands into the Domain. Since commands go onto a bus, they can be queued, prioritized, etc, just like any message on a messaging bus, thus allowing you to ensure your most important commands are handled appropriately (another scalability knob you can adjust to meet your performance needs). Now, since commands require specific intent (ie: user updates their address/places item into shopping cart), this does have implications for your UI -- specifically, you can't have "Excel-like screens". There's no "update everything about this user and here's all the data" command (or there shouldn't be), so if that's what you're looking for, you may want to look elsewhere. But honestly, this may not be a bad thing, as it forces some system designs which will likely result in more user friendly, reliable systems in the long run. This area is the authoritative knowledge source. Your business logic resides here. Your Domain objects reside here. Here is where you'll find the Event Store. This is the most complicated part of the system, and is where the presenter struggled at times to explain some concepts / answer some questions, so this is where you'll likely want to ensure you've done your homework. (To his credit, Jdn fully admitted up front he did not know all of the ins-and-outs of this area and did his best to explain). As commands come into your Domain from the Command Handlers, your Domain objects validate business rules to determine if the command is valid for the current state of the world and either reject the command en-whole, or, in one atomic action, update the state of the world according to the command (thus, an “event” occurs). 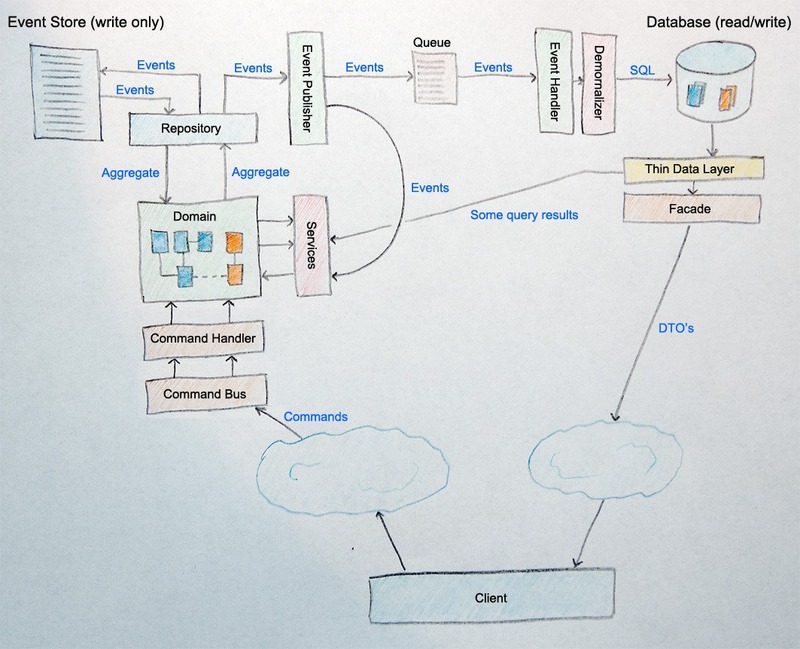 Events are written to the Event Store, which is persisted, likely in an RDBMS, ODBMS, etc. A snapshot of the state of the world is taken periodically and if you want to recreate a place-in-time, just take the previous snapshot and replay the events in order from that snapshot until the place-in-time you care about. Your domain could just remain in memory, if you'd like -- otherwise you'd pull the most recently stored (via snapshot) version of your domain object(s) and replay any new events against that object until it's fully restored, then execute your new command and presto-chango! One note here is that your Event Store is "write only" -- meaning you don't ever delete things from your domain, you just adjust them. The presenter used the analogy of an accountant ("accountants don't use erasers"). If an accountant finds an error in the ledgers, they don't edit that line item -- instead they create an adjustment line item to offset the difference. The Event Store is similar -- you create events to adjust/negate/otherwise manipulate your data. Now, to go full circle, the Domain / Event handling system will publish any events that it handles (but not those that it rejects). Any data stores/caches will subscribe to that feed, and will update themselves based on those events. Thus, your data cache is only as stale as it takes to process the published events. Again, you use a message bus here (or a webservice, etc) and use prioritization queues if you wish to enhance performance/scalability. This is where the concept of "Eventual Consistency" is used -- that is, your Domain and your Data Stores will eventually sync up, just not necessarily in "real time" -- but we're ok with that because we've agreed that latency is almost always ok and availability trumps correctness in the Data Stores -- because "your data is always stale" anyway. All-in-all, this is definitely something I will consider for large systems in the future, although it is likely overkill for most systems in the market I serve. I suggest doing some Google searches if you're interested at all in learning more (seems to be a good deal of data, videos, webinars, blogs, etc. out there). This is one of the larger group meetings I’ve attended, with around 40 – 50 attendees. There were two primary speakers, both presenting remotely using video conferencing. Given the number of attendees, the layout of the conference room and the remoteness of the presenters, it was necessary to use a sound system for the presentations; however there were significant audio issues which forced a late start and a less than ideal experience. I’m hopeful this is not typical (and given the number of attendees, I can’t image it is – otherwise people would stop coming). All-in-all, it was worth going to future meetings. dojox. * - eXtentions / eXperimental (such as data storage access from the js layer using things like flicr, Amazon S3, etc). Dojo has very similar functionality to jQuery (the framework which I am most familiar with – albeit not that familiar). Dojo has a team of full time support and development personel (~10 people) supported by corporate sponsers, plus many official contributors. To contribute to Dojo, you must go through an application process, including some legal documentation to ensure the intellectual property stays with Dojo. It wasn’t clear to me what this extra level of red tape brought to the table that wasn’t provided by using an appropriate open source-style license. Ultimately, given that my primary web development environment is ASP.NET, much of what this library provides is either better done (in my opinion) on the server side or is fully supported by the jQuery framework, which is being integrated into the ASP.NET framework – so I’ll likely be sticking to jQuery. But for folks who aren’t using .Net (aka: all you Ruby, PHP, TCL developers out there), this is another alternative which may be more appropriate for dramatic UI effects. Jake Lumetta (http://jakelumetta.com, twitter: @jakelumetta) presented his website http://chicagotechcal.com/ (twitter: @chitechcal) which is an aggregate calendar of Chicago-area technical user groups. I’ve already found this to be a great resource! !